Whether you’ve come to Orange Beach on vacation or for business, you deserve to take a moment for yourself – away from the kids or the conference room. Just you and your thoughts … and a professional spa or salon therapist dedicated to your wellness and beauty. It’s fun to try a new salon while you’re traveling. 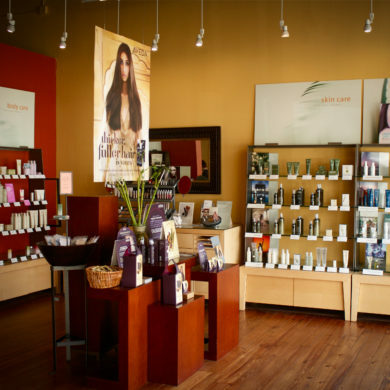 Lucky for you, Orange Beach is home to one of the best – Fusion Spa Salon Aveda. Founded in 2003 by Christian and Tandy Hinrichs, the Fusion Spa Salon partnership with Aveda has grown from one Pensacola Beach-based spa to several locations along the Gulf Coast. At the heart of every Fusion Spa Salon is service. Your experience will be customized to you and how you are feeling at the time of your visit. We recently chatted with Brittany Johnson, education director, to learn why Fusion Spa Salon is the best place to relax and renew on the coast. Q. Why should visitors to Orange Beach choose Fusion Spa Salon over other area spas? We are conveniently located in the entertainment district of The Wharf at Orange Beach. Our expert teams of spa and salon professionals create amazing experiences by integrating elements of science, nature and human touch. We’ll make you look and feel your best. Q. What is unique about a Fusion Spa Salon experience? Enjoy moments of wellness. Each appointment begins and ends with a complimentary stress-relieving ritual. So whether you set aside an hour or a full day, we can offer the perfect place to escape and renew. Q. Would you encourage visitors to Orange Beach to take time out for themselves with a spa appointment? Yes, of course. Whether you are on a family vacation, a business venture or just stopping through for the day, let our team ground you with Ayurvedic healing traditions. Our skilled professional spa and salon therapists combine products and services to treat your hair, skin, nails and body. Fusion Spa Salon is located at 4776 Main Street, Suite 109 in Orange Beach. To learn more or book your appointment, call (251) 224-4247 or visit the Fusion Spa Salon Aveda website.